“Kona Kings & Queens” is a whole series of posts on a few of the interesting athletes in the Kona field – just look through the recent posts! Ironman will do live shows Tuesday to Friday at 8am Hawaiian time (2pm ET) on their Facebook channel (http://facebook.com/IRONMANnow). That’s also where the race will be shown on Saturday. Talbot Cox has a series of videos in his “Kona 2018” series on YouTube. The Ironwomen podcast has interviews with most of the female Pros on their Facebook page. They will also do live coverage of the race on Saturday focused on the female race. Witsup and Stef Hanson have a YouTube playlist “Kona Chatter 2018” with the top female Pros. I’ll add to this list as soon as my friends and I release more information closer to the race! 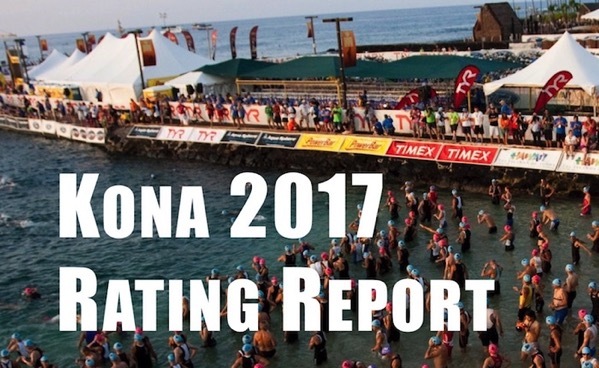 TriRating’s main feature is data about Ironman-distance races and my analysis of these results. This post describes the different types of race posts and the data in them. This is usually my first post about a specific race. 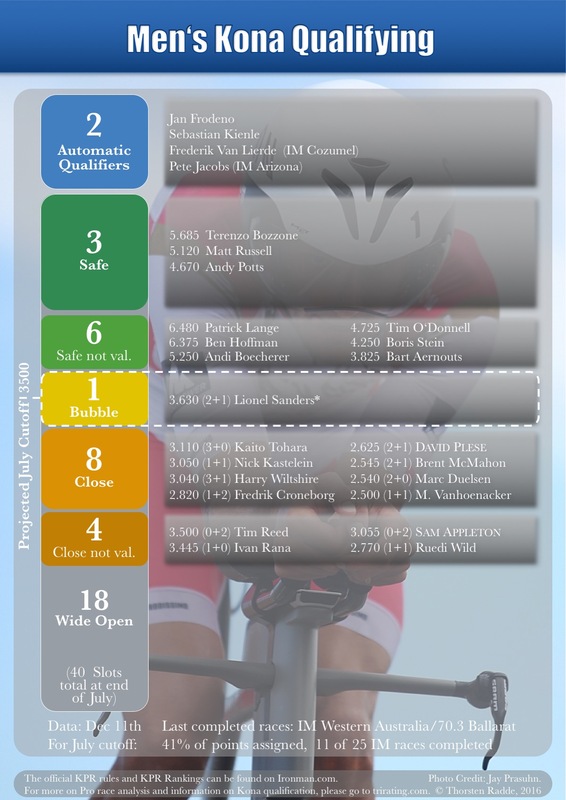 A couple of weeks out there is information about which Professionals have registered for a race. At this point, the list is not final yet – there are still some more athletes that can register, and some athletes that registered may withdraw before race day. 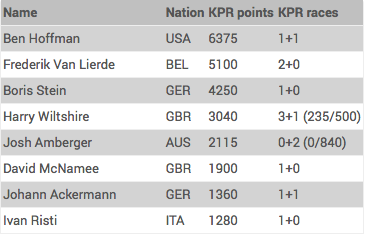 The list shows the Pros that have entered a race, ordered by their bib number (when already available), their KPR points (if it’s an Ironman® race) or their last name. KPR races: The number of Ironman and 70.3 races that the athlete’s KPR points are coming from. For example, “3+1” for Harry Wiltshire means that he already has three Ironman races and one 70.3 race in his total. (Remember that only up to four races – up to three IMs and up to two 70.3s – can contribute to an athlete’s total.) The points in brackets show the lowest scoring race from each category, so “(235/500)” for Harry mean that his worst IM score is 235 points, and his worst 70.3 score is 500 points – these are scores that could get bumped from the total when he tries to add another race to his total. I won’t be publishing entry lists for all races, as not all races make this information available in a timely fashion. Ironman is usually posting Entry Lists roughly four weeks out from a race. After a race has been closed for entry by Professionals, a start list is posted by the race organizer, typically two weeks before a race. Late entries are possible but pretty rare, late withdrawals are much more common. Also, athletes often register for a number of races within a short time, giving them a back-up race in case something happens in the first race they target. Rank: The expected place of this athlete based on everyone’s previous results (and every athlete on the start list starting and finishing the race) and their corresponding expected time (see below). Expected Time: The time I expect an athlete to finish on the course of the race, based on the athlete’s previous results and how fast or how slow the course is, also favoring results from the course. The background color shows who are the fastest athletes (dark red – expected time within 12 minutes of the projected winner) and who are close (lighter red – expected time within 25 minutes). Rating: The weighted average of an athlete’s previous performances. This is more stable than the expected time (i.e. older results are not discounted quite as much) and course-neutral. For example, Yvonne Van Vlerken has a better rating than Meredith Kessler, but as Meredith has performed extremely well in Taupo, her expected time is the fastest. Expected Swim, Bike and Run: Similar to the Expected Time, but broken down for each of the legs and the athlete’s strengths and weaknesses. Again, the background color is used to show the expected fastest athletes in each of the legs. Consistency: The consistency shows how often an athlete has performed to the expected times. The first number (e.g. “60%” for Meredith) indicates how often the athlete was close to the expected time (roughly within 20 minutes), the second number (“+10%”) how often she was faster and the third number (“-30%”) how often she had a sub-par race (including DNFs). The last number, shown in brackets (“(26)”) shows the total number of IM-distance races an athlete has started. You can find a longer discussion of the consistency in this post. Overall: The place the athlete has in the overall rankings. Numbers shown in brackets (e.g. “(52)” for Emma Bilham) indicate where an athlete would be ranked, but that he/she does not currently have a valid rating (requiring one finish within the last year and at least three finishes). Once the race has been completed, I publish the results with my analysis of how the athlete performed, usually within a day or two after the race has been held. Rank: The position the athlete finished in the professional race. Name: The full name of the athlete, depending on how the athlete has performed relative to the expected time and the conditions on race, the name is shown in red (more than 3 minutes slower), in green (more than three minutes faster) or black (within three minutes of the expected time). Swim, Bike and Run: The times for the swim, bike and run legs, again colored according to how well the athlete performed on race day. The background color is used to indicate who had the fastest time in each leg (dark green) and who was close (lighter green). Time: The “clock time” of an athlete’s finish at this race. A “DNF” indicates that the athlete didn’t finish the race, the splits are given as far as the athlete has completed the race. Diff to expected: The difference of the total time of an athlete compared to the expected time (based on the conditions on race day). Prize Money: The prize money the athlete has earned for his finish in the race. 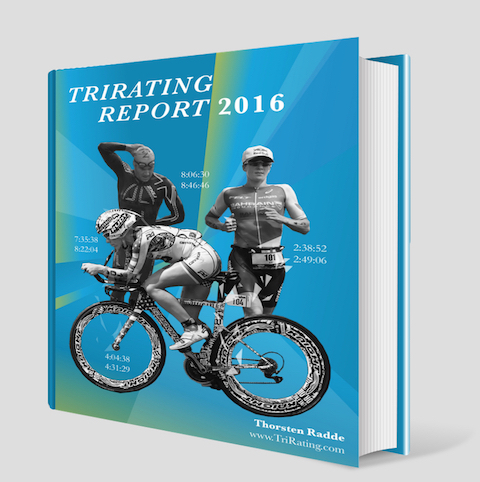 I’ve been busy working on my free TriRating Report 2016, an 80-page PDF filled with results, data, and analysis about the 2016 season. Please use the URL https://gum.co/2016RatingReport to get your copy (or click on the image on the right). Read about my male and female “Athletes of the Year” and “Rookies of the Year”, as well as the athletes receiving the “Bookend Award”, “Persistence Award” and “Steady Progress Awards”. Of course the report also contains the Top 10 Ratings (overall and individually for swim, bike and run), the fastest 2016 times and best performances, 2016 Money Lists and a look forward to the 2017 racing season and to Kona 2017. I’m sure that you’ll like what I’ve put together, so order today to re-live the 2016 season and get fired up for the upcoming 2017 races! The report is available for free, but you can show your support of my work by donating an amount of your choice. As always, thank you for your feedback and support! I have just released the 2017 edition of the KPR Observer, following Kona qualifying for the Professional athletes. 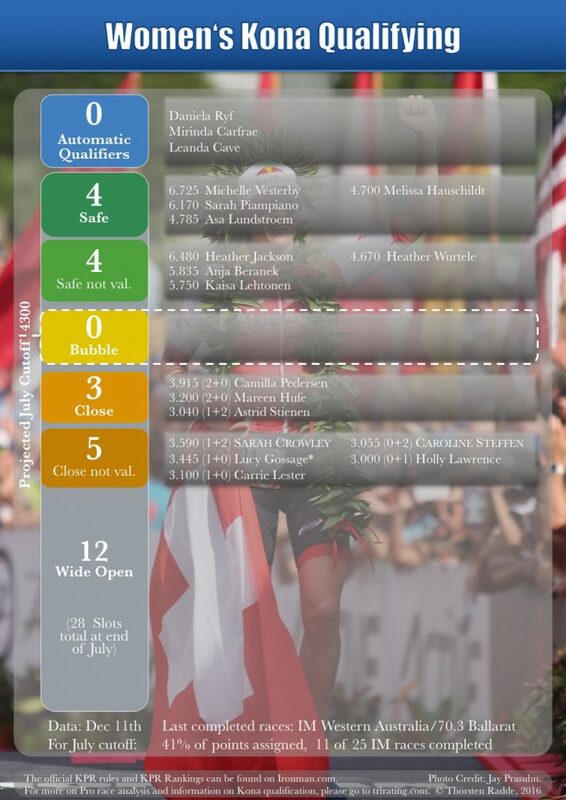 The Kona Pro Ranking (or KPR for short) is the system used to determine which Professional triathletes qualify for the Ironman World Championships in Kona. The 2017 KPR Observer consists of an Initial Information Package about the KPR and ongoing updates during the season. During the season, there will be at least six EMail Updates (and probably ten) about the KPR Standings, who is already in, who is close to qualifying, how many slots are still open and updated estimates of where the cutoffs will occur. If you want to qualify as a Pro, coach a Pro athlete, write about professional Ironman racing or are otherwise interested in the KPR, this is must-read information! The time you’ll save with the KPR Observer is easily worth the price of 29$ for the full season.